Wyoming: It’s the nation’s least populous state and is known for its wide-open spaces and steadfast, pioneering spirit. Though it’s home to well known destinations like Jackson and Yellowstone, much of its beauty remains undiscovered by the masses. 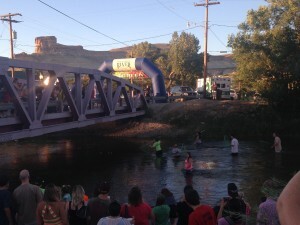 Sweetwater County’s 10,500 square miles is one of those places. 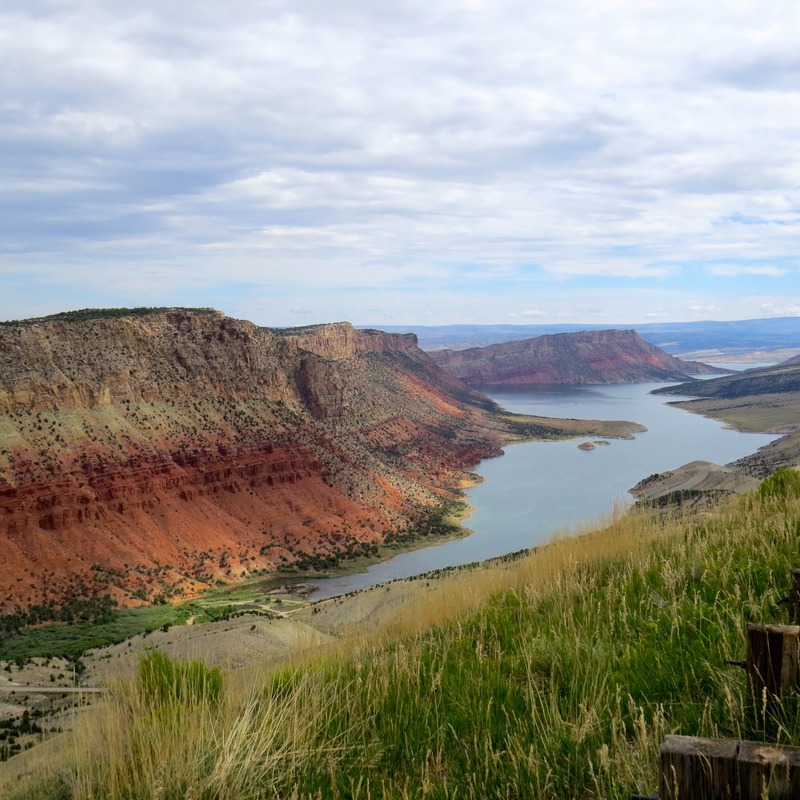 Utahn’s may know the Rock Springs and Green River I-80 exits as a stop on the way to Yellowstone, the gateway to Flaming Gorge, or simply a place to buy cheap booze and lotto tickets. 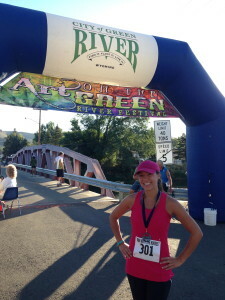 I made the two-and-a-half-hour drive there primarily to race the Running with the Horses 10K, but I found much more to see and do. Whether mountain biking, riding horses, ghost town touring, walking in the steps of pioneers, or enjoying a summer shrimp boil along the Green River, there’s no shortage of adventures in what remains of the Wild West. So make it a Wyoming weekend and check a few of these must-sees off your list. 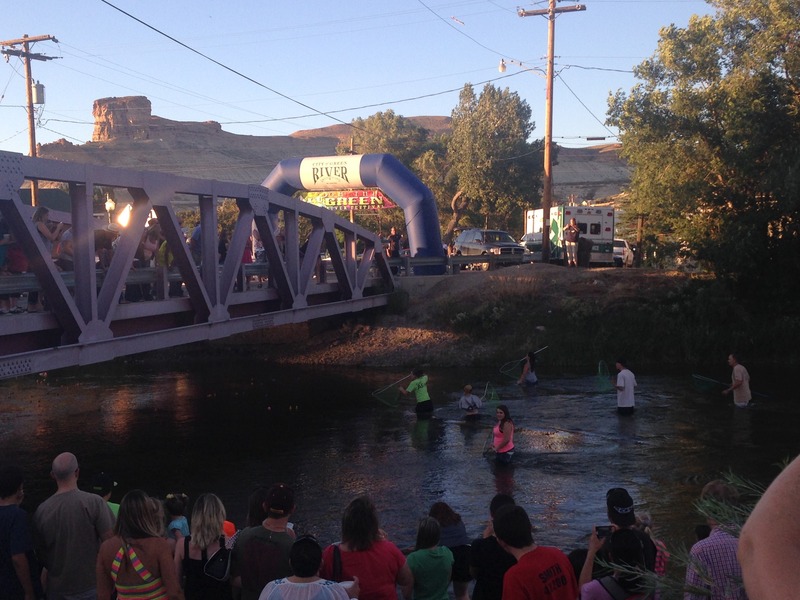 Green River’s Expedition Island, the launching site of John Wesley Powell’s 1871 Green and Colorado River Expedition, is also home to this popular summer festival on August 17-18. 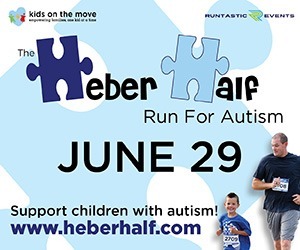 Events include: Cajun Shrimp Boil and pasta feed, Great Rubber Duck Race, live music, car show, dog show, fireworks, and the popular Running with the Horses Marathon, Half Marathon, and 10K. 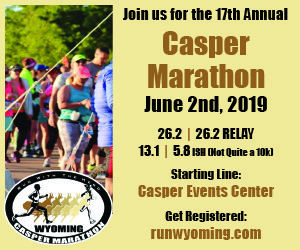 Named Running for the Horses Marathon for a reason, half and full marathoners can expect to see wild horses along the course, and this was a huge part of why I wanted to participate. However, the steep uphill dirt road course is challenging for even the strongest runners. 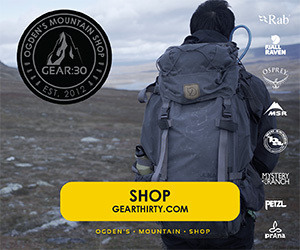 Unique finisher medals and coveted wild horseshoe and Trona Trophies for age and overall winners make it worth the drive to participate! 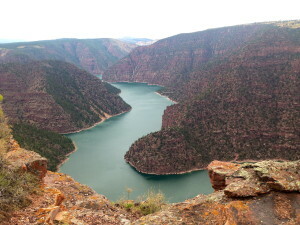 After river festing and racing, drive along the scenic Highways 191 and 530 that encircle Flaming Gorge National Recreation Area for an adventure in and of itself, or add recreation on or off the water. Located just east of Flaming Gorge Reservoir is Little Mountain, a popular moun tain biking destination with 250 miles of trails offering scenic views up to 100 miles. Or see the Green River up close on whitewater day trip below Flaming Gorge Dam. Crossing over into Dutch John on the Utah side you’ll find Red Canyon Lodge. This hidden retreat is a great day or overnight stop on your Wyoming journey. From the property, take a guided horseback ride or hike along the Red Canyon Rim trail for expansive overlooks of the Gorge. 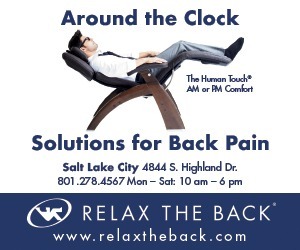 Cool off after by canoeing, kayaking, or stand up paddleboarding around their lake. Rentals are just $15 an hour. Stay for lunch on the patio overlooking the lake, and don’t miss the Smoked Trout appetizer! 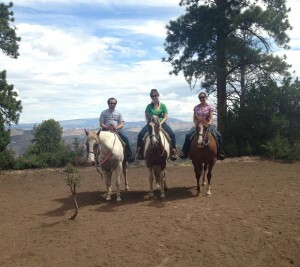 Where else can you see the Oregon Trail, Native American petroglyphs, and herds of wild horses in one spot? 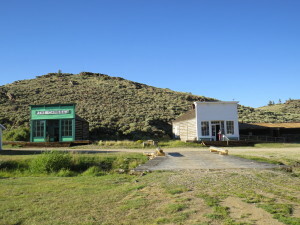 Sweetwater County boasts more miles of intact trails from the Mormon, Oregon, and Pony Express crossings than anywhere else in the country, and you can easily access them from major roads. Slightly more remote are the White Mountain and Cedar Mountain Petroglyphs, about 30 miles northeast of Rock Springs down a washboard dirt road. 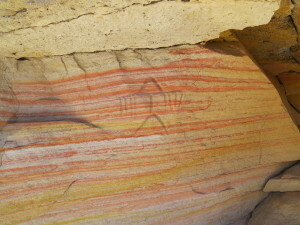 These well-preserved sandstone panels are covered in 200 to 300-year-old etchings by Native American tribes who once inhabited the area with figures of elk, deer, and humans. Local outfitter, Killpecker Tours, offers guided visits; solo-types can drive to the region—in a 4WD vehicle—and hike to explore them. Cedar Mountain is less trafficked, and you’ll likely be the only group at these petroglyphs when you visit. 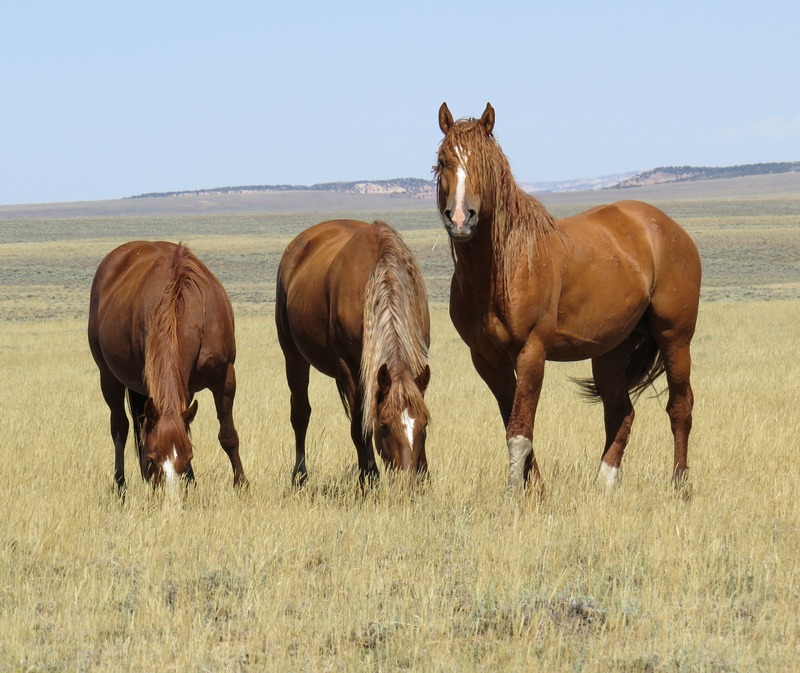 Sweetwater County’s gorgeous wild horses are descendants of those brought by the Spanish in the 1500s and are known for their curly manes. 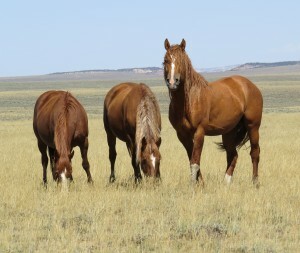 Finding them on your own can be tricky, so it’s best to again employee the services of local wild horse enthusiast, Pat Doak, and John Vase (her business partner at Killpecker Tours) to find Curly, a huge stallion followed by a herd of beautiful mares. Pat and John take you up close to the sites while sharing local lore along the way. Plus, John’s wife makes an impressive sack lunch with fresh fruit salad and inventive sandwiches. 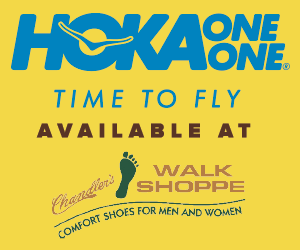 Add on stops at historic cabins and sand dunes too if you’re up for an all-day exploration. Great tour for families too! 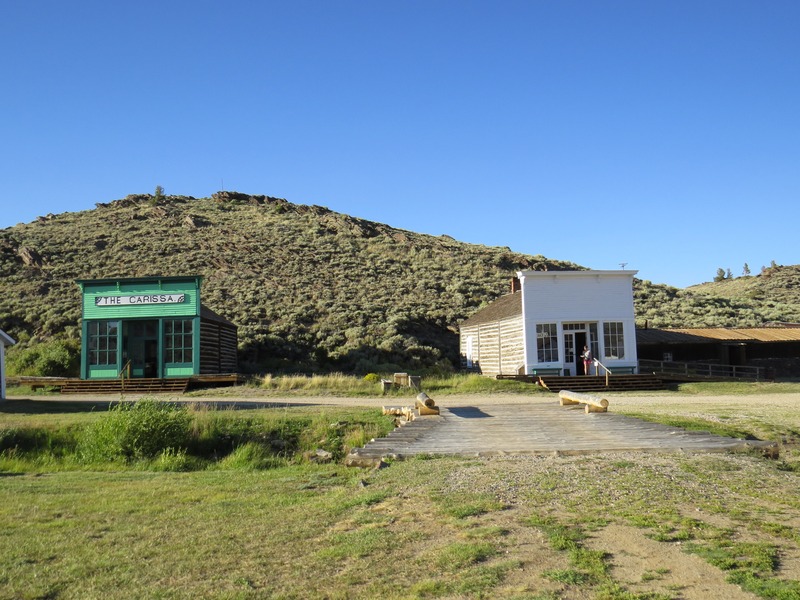 If Wyoming doesn’t feel remote enough already, get out of dodge and drive an hour and a half north to historic South Pass City, a once booming mining town turned historical landmark. 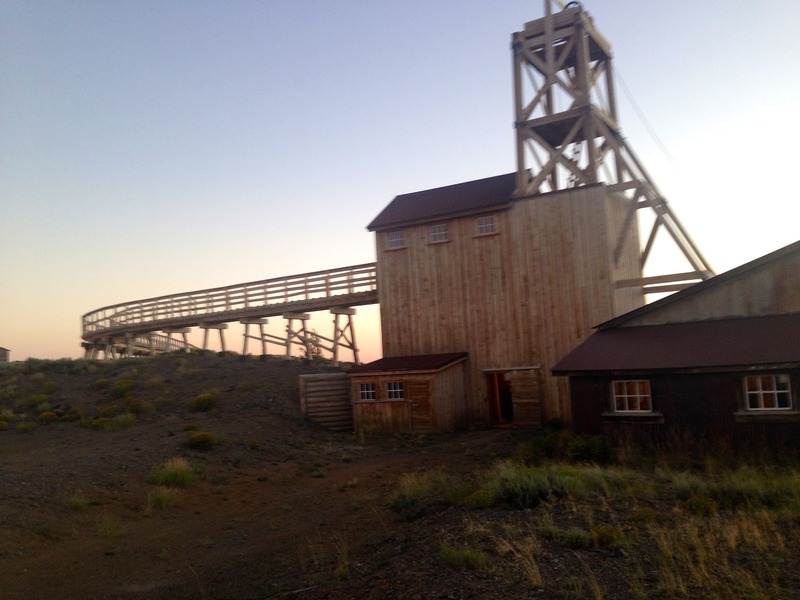 Throughout the summer you can tour the preserved town and nearby Carissa Gold Mine, but for a special treat visit on June 20 or August 22 (perfect for pairing with the River Festival) for the Catch the Night Shift Tour. 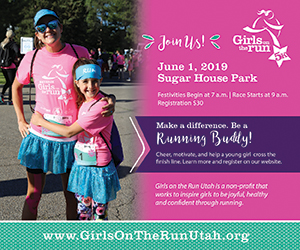 Begin by exploring South Pass City’s restored homes, hotel, jail, and shops to get a glimpse of what mining town life was like, stopping along the way for cookies and a scotch tasting at the old Miner’s Exchange Saloon. I learned I can’t handle much scotch, but sipping it in the old saloon while listening to old-time piano music made the experience. 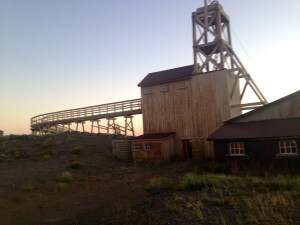 Once the sun sets, make your way to nearby Carissa Gold Mine for a spooky, lantern-lit night tour of the mine’s inner workings. 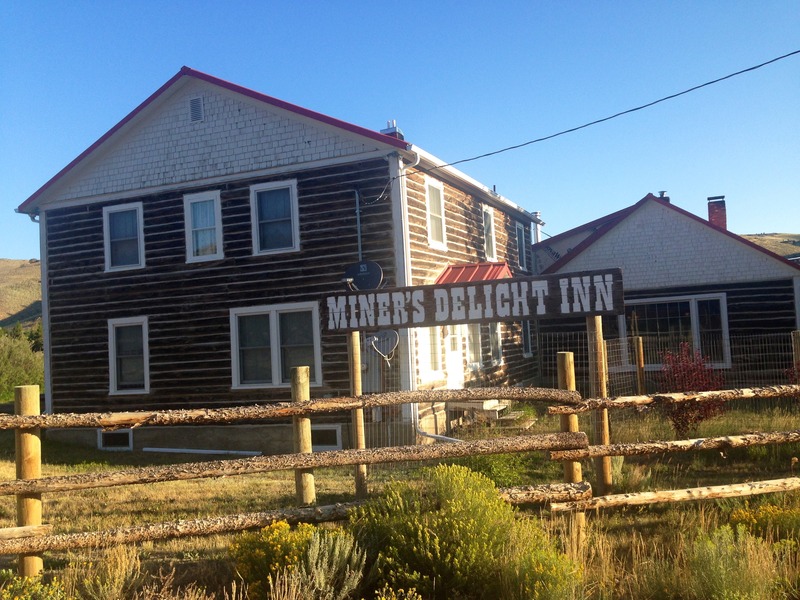 Despite this tour’s seemingly middle-of-nowhere location, accommodations are available just four miles away in the sparsely inhabited mining town of Atlantic City at Miner’s Delight Inn B & B. Fewer than 40 folks call Atlantic City home today, but the town boasts cedar plank specialties at the historic Atlantic City Mercantile Restaurant and is a good home base for visiting other ghost towns, like Miner’s Delight. 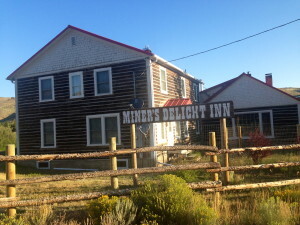 Barbara and Bob Townsend, Miner’s Delight Inn owners, refurbished the former Carpenter Hotel to turn it into this bed and breakfast with bedroom and cabin accommodations and a from-scratch breakfast in the morning. The Inn’s fully stoked bar features rare Scotch whisky from around the world, and guests can enjoy a drink in their saloon before retiring for the evening. 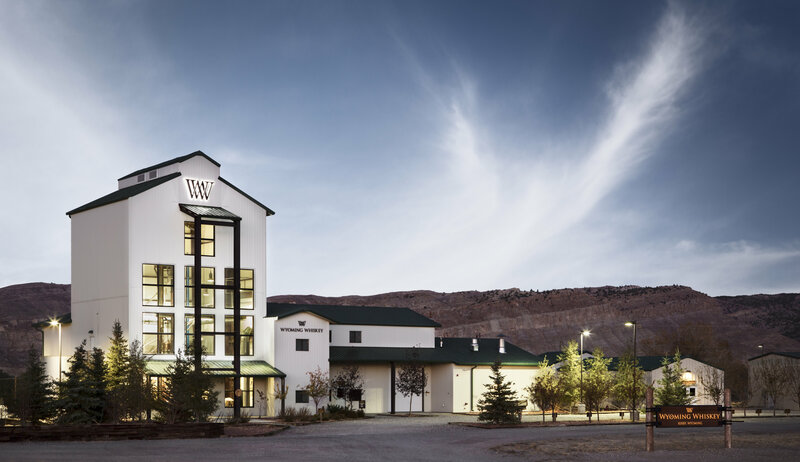 Bourbon lovers: stop and pick up a bottle of Wyoming’s first premium whiskey throughout the state during your trip (it’s available in Utah too). 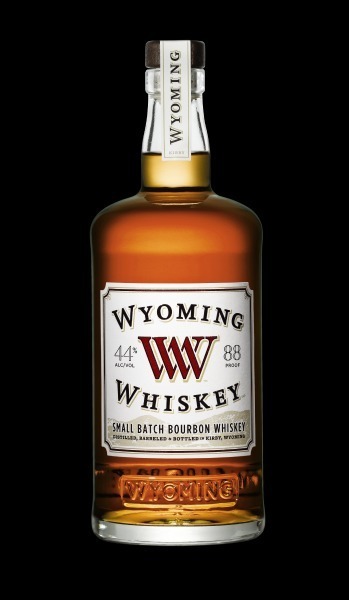 They distill in small batches exclusively at their Kirby, W Wyoming distillery using Wyoming grains and water from a local limestone aquifer that contributes to its unique flavor. This flavor helped Wyoming Whiskey receive numerous accolades at bourbon competitions across the nation. Though it’s almost a two-hour-drive from South Pass City to their Kirby Distillery for a tour, discerning bourbon drinkers will find it a worthwhile stop. As you make your summer road trip plans, take a detour from your normal route and explore one or all of these lesser-known Wyoming wonders.